These days, more and more homeowners are retrofitting their properties with outdoor spaces and kitchens to take advantage of two wonderful things: good food and good weather. With such long winters here in Minnesota, it’s great to make the most of this welcome weather outside. We love creating outdoor spaces and would love the opportunity to discuss your needs. We can help you upgrade from a lonely grill to a more complete kitchen, take your bland backyard and turn it into an outdoor oasis, or add that pool and jacuzzi you’ve been dreaming about. Mantis Design + Build has won numerous national awards for our outdoor spaces. We’d love the opportunity to show you what we offer. Imagine having all of the appliances and tools you need right in your very own outdoor setting. With an outdoor kitchen from Mantis, you’ll be able to cook, fry, and sauté your way to a gourmet meal, all the while breathing fresh air and taking in your outdoor surroundings. 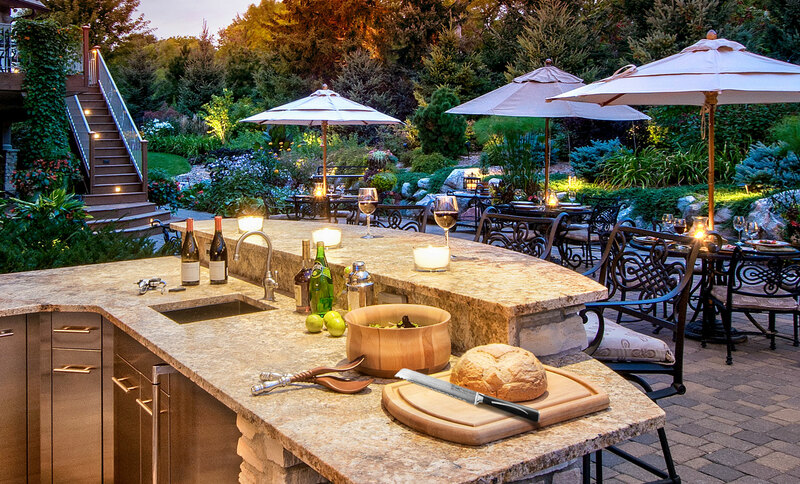 Best of all, by adding an outdoor kitchen, you’ll be improving your home and increasing its value. An outdoor kitchen from Mantis is a great way to add some extra fun to those times when you want to relax with your family and friends without being stuck inside. Give us a call today to learn more about your options or to schedule an estimate.